Top Five Things to Do in Medel.. 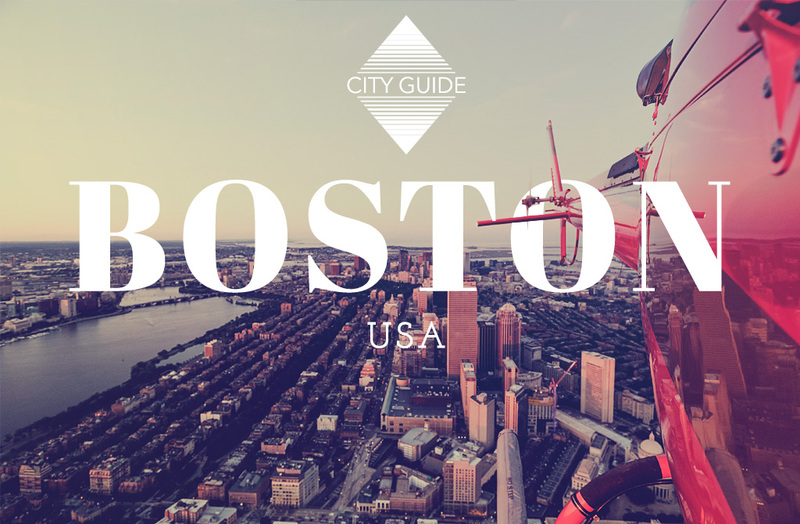 The City Guide Boston gives you an in-depth look at one of the oldest cities in America. Ever since I moved back to Boston in June, I’ve been eager to reacquaint myself with my home and do some backyard travel. For a city that used to be so familiar, everything has become fantastically unfamiliar and I find myself relearning all things I once knew by heart. 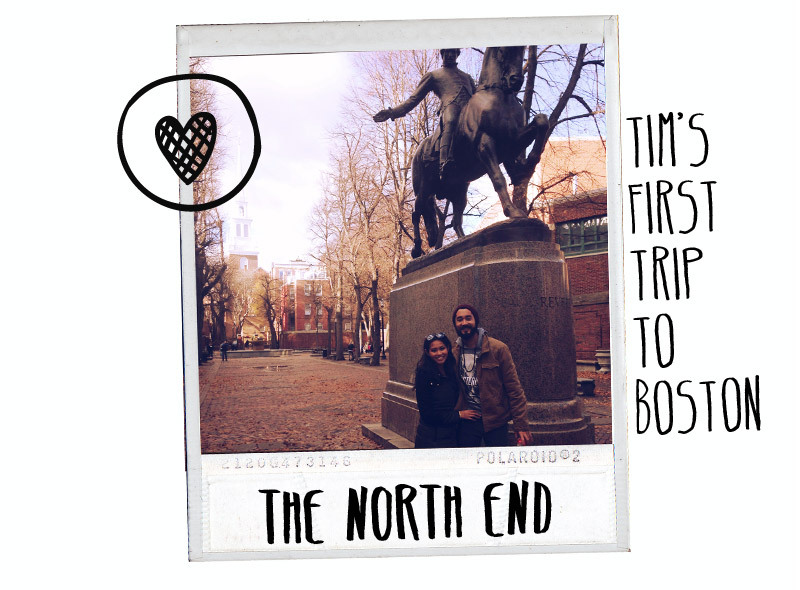 I’m lucky to have been given a second chance at getting to know my hometown in this City Guide Boston. Boston is the capital of Massachusetts, the 6th state in the USA. Located on the eastern seaboard, it is only a 4-hour drive from New York City. Every corner of Boston is laden with history and even though the United States is relatively young compared to every other country in the world, there’s something about Boston that feels rather nostalgic and sentimental. It’s a city of firsts, instilling in every Bostonian a sense of unrivaled pride for all the accolades present in one city: the first metro in the continent, the first public park in the USA, the first university in the Americas… we even have the oldest running restaurant in the country! Whether by land or by sea, helicopter or your own two feet, Boston is begging to be explored. I highly recommend you read up on different Tourist Passes to get the most bang for your buck for when you visit. Traipse around the promenade of FANEUIL HALL MARKETPLACE, visited by 18,000,000 people annually looking for a taste of Boston with over 100 shops and restaurants. Catch America’s favorite pastime at the country’s oldest major league baseball stadium, FENWAY PARK, home of the Red Sox. Follow the red brick road, also known as THE FREEDOM TRAIL, a 2.5-mile long, free self-guided tour of Boston’s historic sites leading you to the likes of Old North Church, Paul Revere’s house, and the USS Constitution. Appreciate Boston’s immigrant communities in places like THE NORTH END, Boston’s Italian enclave where pastry rivals Mike Pastry’s and Modern Pastry battle it out for the best cannoli (a Sicilian dessert). In CHINATOWN, the neighborhood denizens play seemingly endless games of mahjong near the Chinatown Gate. 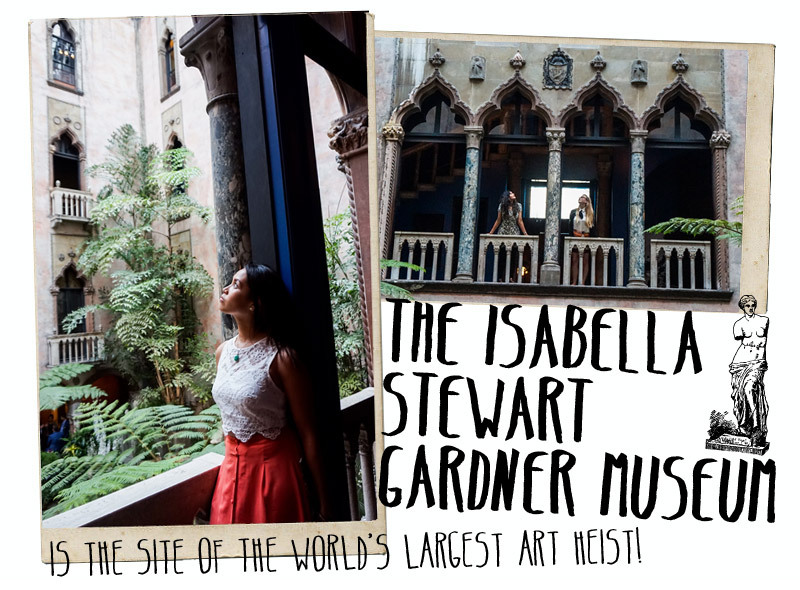 For art museum mavens, ogling the one-of-a-kind collection of ISABELLA STEWART GARDNER in her private Venetian atrium is a must. It’s free admission on your birthday and if your name is Isabella, congrats! You’ve won free entry for life! The empty frames on the wall used to be the home of pieces that were stolen in the world’s most expensive art heist back in 1990. More a modern art fan? THE INSTITUTE OF CONTEMPORARY ART (ICA) sits by the waterfront and is free every Thursday from 5-9 pm, while the extensive exhibitions of THE MUSEUM OF ARTS can be enjoyed for free every Wednesday from 4-9:45 pm. The brownstone-lined NEWBURY STREET in upper crust Back Bay is a congregation of high-end designer boutiques, as well as fast fashion names like H&M and Urban Outfitters. PS, Clothes are tax-free in Massachusetts. Survey the city from new heights atop the Prudential Center’s SKYWALK OBSERVATORY. Kill two birds with one stone by going one floor up to visit the ritzy TOP OF THE HUB restaurant, featuring cocktail lounge seats that offer the same view, plus a drink in hand. … Continuing on with fresh perspectives, rent a kayak and paddle along the CHARLES RIVER, swerving through sailboats, to admire the best view of the Boston skyline. Walk down Boston’s most photographed street, the picturesque ACORN STREET a narrow cobblestone alleyway lined with gas lamps and rowhouses from the 1800s. In September, thousands of collegiates flock to the academic hub of the United States. Visit the hallowed grounds of America’s oldest higher education institution, HARVARD UNIVERSITY, with MIT a stone’s throw away down Massachusetts Ave. Visiting in winter? Glide across Frog Pond Skating Rink set in BOSTON COMMONS, the oldest public park in the United States. Right across the street is BOSTON PUBLIC GARDENS, best enjoyed in the summertime, when fleets of swan boats can be seen drifting across the pond and the garden is in full bloom. Eating seafood is about as New England as it gets. In Boston, you have plenty of options, almost too many, so here’s the general breakdown: JAMES HOOK & CO. (15-17 Northern Ave, Boston, MA 02110) has been loading up their lobster rolls since 1925, but NEPTUNE OYSTER (63 Salem St # 1, Boston, MA 02113) is also in the running for Boston’s best lobster roll. THE BARKING CRAB (88 Sleeper St, Boston, MA 02210) is an open-air dining establishment right on the waterfront. The space is famous on the tourist track, but the food has been waning in quality. LEGAL HARBORSIDE (270 Northern Ave, Boston, MA 02210) by popular vote, wins Best Clam Chowder (known by locals as “chowdah.”) Endorsed by Ronald Reagan, the Legal recipe is served at every presidential inauguration and can be found at Fenway Park too. Last but not least, slurp up some of that Boston brine from freshly shucked oysters at UNION OYSTER HOUSE (41 Union St, Boston, MA 02108), the oldest restaurant in the USA in continuous operation. GIACOMO’S (355 Hanover St, Boston, MA 02113) The people come en masse to this one room, family-operated trattoria right on the main drag of The North End. Expect a line, no matter how early you get there, with an average wait time of 2 hours on a sunny day. The standouts on this Italian menu are the Butternut Ravioli and the Linguini with a Fra-Como sauce (a hybrid of the house marinara, the Giacomo, and the fra diavolo, a spicy marinara.) If you can’t stomach the wait, there is a second restaurant in South End that accepts reservations, is much quieter and larger, but lacks the ambiance of the flagship. Cash only. BOSTON PUBLIC MARKET (100 Hanover St, Boston, MA 02108) The newest addition to the Boston food scene, the indoor food hall opened in 2015 showcases around 40 vendors selling the freshest bounty that is all locally sourced (each stall identifies where all their ingredients come from.) With a mission to educate and nourish the community, you can also take cooking lessons at THE KITCHEN, an on-site kitchen studio. My top picks: Taza Chocolate (ground Mexican chocolate), Bon Me (Asian fusion), Red’s Best (seafood), and Crescent Ridge (ice cream). ROXY’S GRILLED CHEESE (292 Massachusetts Ave, Cambridge, MA 02139) Once a food truck, the Roxy’s Grilled Cheese enterprise grew so big that it is now a brick-and-mortar shop. Today, the city’s most famous grilled cheese purveyors flip and sizzle gourmet grilled cheeses and you can order them also gluten-free and/or vegan! Just don’t forget the truffle fries. At the Cambridge location, a “barcade” for pinball wizards who can hold their drink is hidden behind the seemingly innocent swinging kitchen double doors. After the double doors, you’ll see a refrigerator door leading up to the secret A4CADE. Race your buddies on the coin-operated driving simulators and drink mystery slushies out of R2D2 cups. MR. BARTLEY’S (1246 Massachusetts Ave, Cambridge, MA 02138) The kitschy decor, riotous atmosphere, and extensive menu are but a few things to fall in love with at Mr. Bartley’s. The burgers are All-American and they don’t want you to forget it with each burger named after local personalities such as “The Joe Biden” and “The Tom Brady (Triumphant! ),” Hollywood superstars like “Snoop Dogg” and “Beyonce (Hot! ),” and anything relevant to current events like “The MBTA” and “Cuba.” With a menu that gives you an insight into Boston humor and onion rings to match, you won’t leave hungry or bored. And they keep the drinks retro— think: lime rickeys and frappes. GOURMET DUMPLING HOUSE (52 Beach St, Boston, MA 02111) Another spot where the long line is synonymous to good eats. 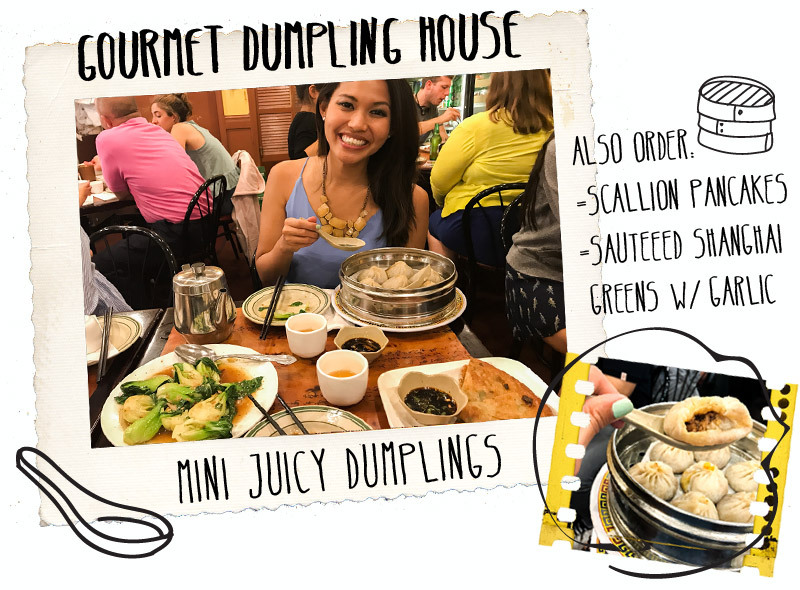 This pan-Chinese single room restaurant has an overwhelming menu but you’d be an absolute fool to you miss out on their mini juicy dumplings, which are super-sized soup dumplings. There are only two kinds: pork and pork and crabmeat. If you want to get seated fast, don’t go with a large group. And I have to confess: their xiaolongbaos may be better than Din Tai Fung. Keep drinking the house tea to curb the bloating. 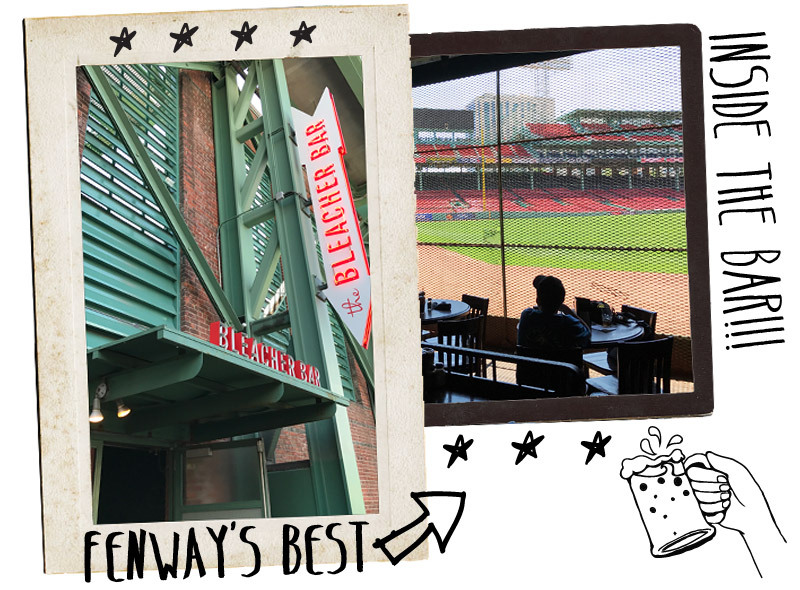 BLEACHER BAR (82A Lansdowne St, Boston, MA 02215) The most unique feature at Fenway Park is a bar built beneath the stadium bleachers. A floor-ceiling-window looking out onto centerfield gives bar guests an unbeatable view of the action, all from the vantage point of the Green Monster wall. Be prepared for a packed room on game days, but no complaints: you’re watching the game for the cost of a pint of beer. Sweet Caroline! YUME WO KATARE (1923 Massachusetts Ave, Cambridge, MA 02140) The concept is simple: finish your serving of ramen, announce your dreams to the whole restaurant. The logic is that if you can finish up the bowl, you can achieve anything you want in life. The space is tiny but if the countertop dining setup will transport you instantly to Japan. The homemade noodles prepared in a slow-cooked pork-based broth will speed up the jetsetting to Japan vibes. Just opened: the udon answer to Yume Wo Katare, YUME GA ARUKARA (1815 Massachusetts Ave., Cambridge). The idolatry of coffee in Boston is obvious by the profuse amount of Dunkin Donuts shops found on every corner of the city. Dunkin Donuts is an institution in all of Massachusetts, providing cheap coffee on-the-go for the working/student populace. Greater Boston is also the birthplace of the premiere DUNKIN DONUTS (543 Southern Artery, Quincy, MA 02169) coffee shop in the country. POLCARI’S COFFEE (105 Salem St, Boston, MA 02113) is the most visited coffee joint in Massachusetts and is very photogenic on a downcast day. Dessert shops in Boston warrant a larger conversation but here are some musts when you get to your dessert course. OMNI PARKER HOUSE (60 School St, Boston, MA 02108) Boston cream pies has been pleasing crowds since its conception in 1856 in the hotel restaurant. MODERN PASTRY (257 Hanover St, Boston, MA 02113) and MIKE’S PASTRY (300 Hanover St, Boston, MA 02113) are two Sicilian desert shops in The North End with whose claim-to-fame relies on their longtime feud. Everyone raves about the cannolis at Mike’s (hollow shells stuffed with sweetened ricotta cheese and studded with chocolate chips or pistachios), but the cannolis are arguably better at Modern Pastry. Get the lobster tails at Mike’s instead. FLOUR BAKERY (12 Farnsworth St, Boston, MA 02110) by renowned chef Joanne Chang’s serves up perfectly glazed sticky buns decorated with chopped pecans. You can’t have just one. TATTE BAKERY (70 Charles St, Boston, MA 02114) is a bakeshop for everybody—they have flourless brownies and cookies that don’t compromise on the flavor. SOFRA BAKERY (1 Belmont St, Cambridge, MA 02138) is a Middle-Eastern cafe with savory and sweet selections, but if you’re not afraid for new flavor profiles, try their Tahini Shortbread and Chocolate Hazelnut Baklava. During summertime, THE LAWN ON D (420 D St, Boston, MA 02210) is Boston’s most happening hotspot hosting a number of events like movie screenings and beer events. 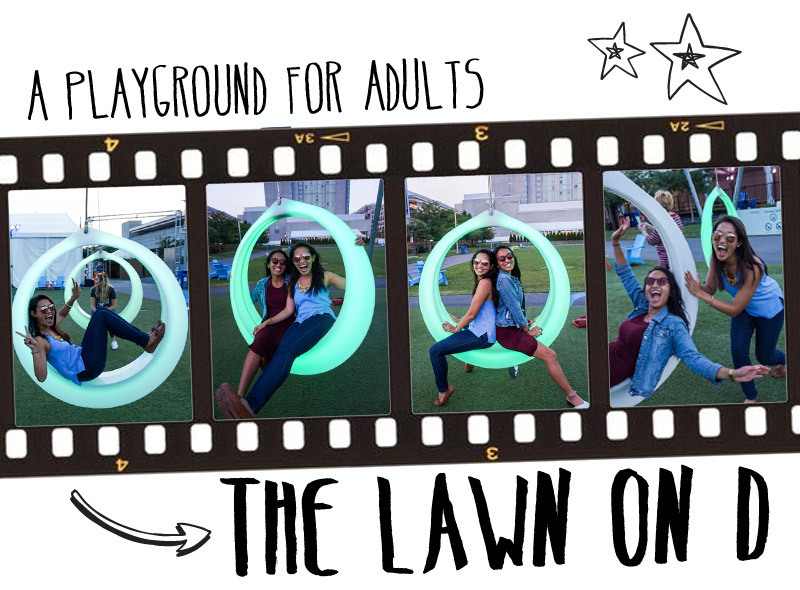 But people don’t go to “the lawn” just for the recreational activities; you cannot miss out on the swing installation, plastic rings rigged with color changing LED lights. Take a swig of local brews at THE SAMUEL ADAMS BREWERY (30 Germania St, Boston, MA 02130), where the tour is free with a suggested $2 donation to sample the brews from the test kitchen, and you get to bring home the collectible glass at the end. HARPOON BREWERY(306 Northern Ave, Boston, MA 02210) is also another favorite (esp. their famous pretzels!) And for the gluten free, check out the DOWNEAST CIDER HOUSE (256 Marginal St #32, East Boston, MA 02128) but book in advance for their free tours that only run on the weekends. Boston is the uncontested sports capital of the United States. Known as the “Championship City” due to every local sports team having won a championship in the last game, it would be a shame to miss out on a CELTICS BASKETBALL AND/OR A BRUINS HOCKEY GAME at TD Garden. I personally find hockey games more thrilling! Each of the six glass towers of the NEW ENGLAND HOLOCAUST MEMORIAL symbolize a major extermination camp and are engraved with the identification numbers of the 6 million Jews that died at the hands of Nazi brutality. Boston, MA 02109) not only has karaoke every night, but also the “Teriyaki Man” who peddles $1 sticks of chicken teriyaki on the dance floor to inebriated college students. By land or by sea: ride around Boston in a military-grade, amphibious DUCK BOAT, which drives straight into the Charles River for two different view of the city. For anyone interested in the world, the MAPPARIUM (200 Massachusetts Ave, Boston, MA 02115) exhibit in the Mary Baker Eddy Library is a stained glass, inside-out globe that is viewed from a 30-foot-long bridge. Also known as the “whispering gallery,” the curvature of the glass allows you to hear a person standing at the other end of the room perfectly. Calling all sneakerheads! This sportswear shop is hidden behind a fake Snapple vending machine that doubles as a sliding door when activated. The vending machine is located in Latino-run convenience store, hence its name, BODEGA (6 Clearway St, Boston, MA 02115), eluding to a small grocery store in Spanish-speaking neighborhoods. Looking to take a leisurely stroll away from the chaos of the city? Enjoy a power walk at CASTLE ISLAND (2010 William J Day Blvd, Boston, MA 02127) and around the historic Fort Independence. Short on time? Take the Castle Island Loop. If you have time to spare, try the Pleasure Bay Loop. Try your hand at candlepin bowling at SACCO’S BOWL HEAVEN (45 Day St, Somerville, MA 02144), where cylindrical candlepins are used in favor of the traditional ten-pin targets. This type of bowling is more common in this part of the United States. Then don’t forget to grub on some delicious flatbread. 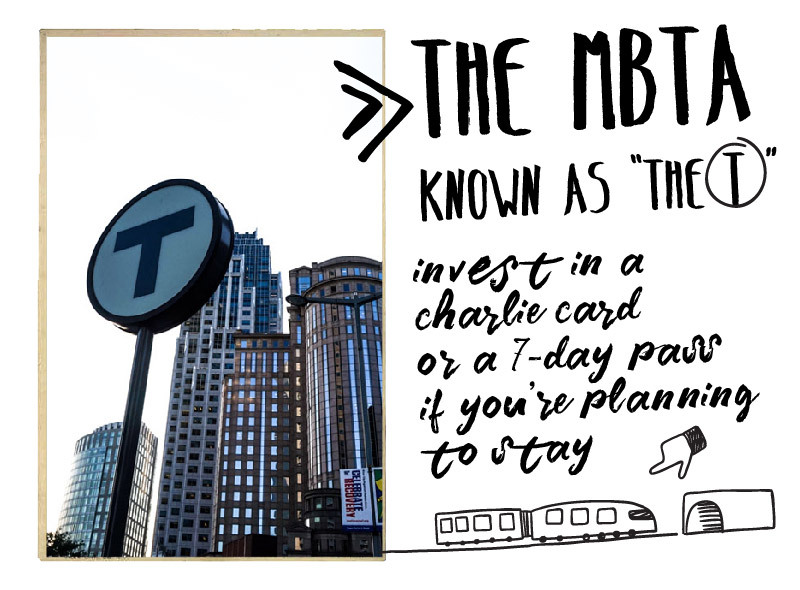 BY METRO Boston’s main mode of transportation is none other than the MBTA, fondly known as “The T.” The T is the America’s oldest subway system (and sometimes it shows). It runs primarily underground but in some areas, goes above ground. The subway system is comprised of the Red, Orange, Green, and Blue Lines, with a Silver bus line that goes to the airport for the same cost as a standard ride. The fare per ride is $2.25. From Logan Airport, find the free Massport shuttles (Route Nos. 22, 33, or 55 to “MBTA Blue Line”) and then when you get to the Blue Line, you can ride the train to your final destination. To Logan Airport, take the Red Line to South Station, then transfer to the Silver Line Bus SL1 , stopping at all terminals. BY CARSHARING Lyft and Uber are the most popular carsharing applications in Boston. Taxi rates are astronomically much higher in comparison to carsharing so if you have mobile capabilities, use those apps. Uber’s surge charges during rush hour traffic are absurd so see check Lyft for better rates. Boston is calling you! Continue building your to-do list with help from these resources! Have you ever been to Boston? Share your tips for seeing the city in the comments below! What a detailed and wonderfully written piece on Boston! Can’t wait to go back and try all the activities you’ve listed! One of the original cities in USA, it seems like Boston has encapsulated history within itself and grown in every way possible. Really enjoyed reading your post, its been quite insightful. Being a foodie myself I would really enjoy gorging on some of the freshest sea food Boston has to offer apart from the famous “chowder” or”chowda”. You do have a unique style of writing things which is quite interesting. The photographs and graphics are also welcome respite for sore eyes. I’ve only been to Boston once and now that I’ve read your post I realize that I didn’t get to see anywhere near enough! I guess I need to go back and explore some more – thanks for the inspiration! GIRL. This post is INCREDIBLE! I have yet to travel to your gorgeous part of the country extensively, but this guide is making me really want to see more of Boston! I can’t get over the design of this all; it’s so you and it’s so perfect. I would love to be able to visit Boston just about now as autumn starts to roll in…ahhh, I miss the states sometimes something fierce! Awesome job putting this together – you’re so talented! I haven’t known that Boston is the oldest city of the US, nor it underground metro. In this case, I wonder how old is the Chinatown? The recommendations for means of transportation are very useful. I don’t have uber in the town where I live, and the most expensive taxi is 2 euros from one side to the other of the town, but I am planning to use uber during my trip to Amman soon. I love your guides! They’re comprehensive enough and easy to read without being exhausting to get through. I haven’t done Boston yet but next time I’m in NYC you’ve made a great case to pop on over and see it for a couple days. Your site always impresses me when I come here. I especially love your video banner at the top. I do, however, have a little quibble… the new hot pink background on the text… Oh my god that’s a wee bit harsh. Just a wee bit. 🙂 Keep up the great work! I love love love this guide. First of all, it’s just stunning, as always. Secondly, it reminds me of that perfect day in Boston when you showed me all around your hometown. That’s my favorite day from that trip. I want to come back to visit you again soon! I want to go to the Isabella Stewart Gardner Museum next time. I really feel like I missed out not getting to see it! This is truly a comprehensive guide that have given me enough idea on what to expect when I get to visit this place. I also love how detailed you are when writing this post, it is really a big help for traveler like me that haven’t been to any place in America. I’ll surely use this as my reference If I get the chance to visit here soon. I think the museum would be a great place to amble around soon If I get the chance. Thank you so much for sharing this with us. This is awesome, so detailed and super comprehensive. I can’t say that Boston has every been on my Must See list, but with the amount of fun-tivities, breweries, artsy things and of course, eats, how can one pass up on a city like that! Seriously, what an exciting destination and those dumplings look and sound Delish! I have never considered Boston to be such a stunning and picturesque! Thank you for the awesome guide and motivating me to go to Boston soon! hands down, you have the most entertaining graphics. but more than that, your post covers a lot and it truly is a comprehensive guide. hubbydoo often travels to Boston but always on business trips so I have to pass this on to him to at least try on some of those featured under your foodie section. Izzy!!! Your posts are always amazing. You nailed it once again. Such a comprehensive and thorough guide to OUR hometown. So cool to check out your go-to spots. We still have to meet up…we’re so close!